Dr. Fixit Pidifin 2K is a two-component waterproofing coating for the sunken portion and splash zone in a leaking bathroom. 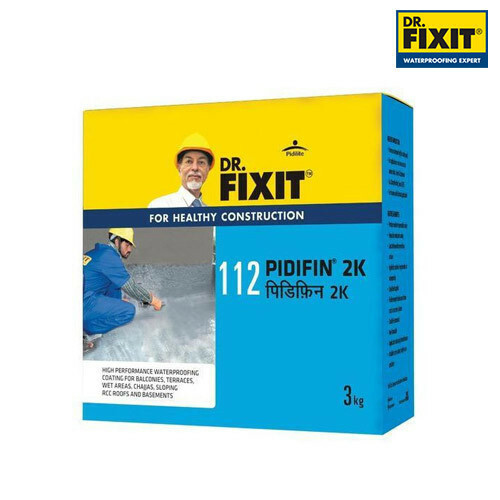 Dr. Fixit Pidifin 2K is an acrylic cementitious, polymer modified elastomeric, waterproofing & protective coating composed of best quality Portland cement, properly selected & graded aggregates, additives & acrylic emulsion polymer as a binder. It is applied to waterproof and protect concrete and masonry substrates. Dr. Fixit Pidifin 2K must be applied to new or old concrete substrates that are structurally sound. Excellent as a waterproof coating for bathrooms, kitchen sinks, balconies, etc. Ideal as a coating for waterproofing of chhajjas, canopies, etc. As the waterproof coating on internal sides of domestic water tanks. Good for waterproofing of sloped roofs. As a waterproof coating for terraces of areas up to 100-150 m 2. Do not part mix. Mix the entire quantity of both the components at one go. Always add powder to liquid to avoid lump formation. Do not cure by flooding with water. Always protect the membrane with screed in areas exposed to foot and other traffic. Store in the shed, protecting from direct sunlight and away from extreme temperature. In extremely hot temperature conditions, store in a temperature-controlled environment i.e.less than 30 Degree C.
Dr. Fixit Pidifin 2K is alkaline and should not come into contact with skin or eyes. Avoid inhalation of dust during mixing. Gloves, goggles and dust masks should be worn, during mixing and handling the product.